Any issues with tags, live ads, or trafficking questions should be directed to the account team or by emailing at TrafficUS@flashtalking.com. Interested in certifying Flashtalking Tags for your site? Please complete the form below to start the process, or contact us by email. Thank you! The Flashtalking Certification Team will be in touch shortly. 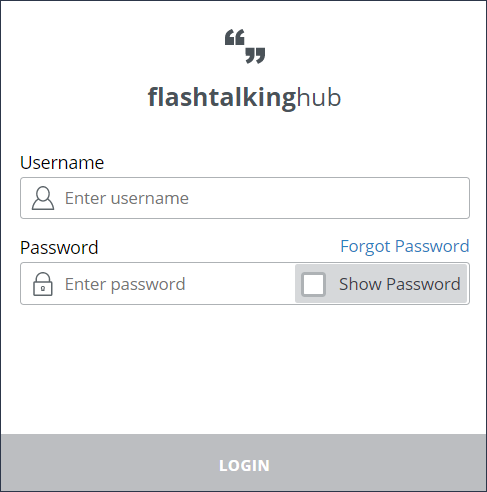 To use the Report Builder, first log into Report Builder in the Flashtalking Hub with your username and password. Once you’re logged into the Reporting application, you will be directed to the main screen where you can click on Create Report to begin. The second section of the page defines the content of the report. The third section is where you define the columns and groupings for your report. Levels: Defines the granularity to your report. You can select from an array of options like Media Buyer, Advertiser, Campaign, and so on. The last section on the page is the Scheduling section. Here you can schedule the frequency of the report and define a start and end date. You can also add the recipients to receive the reports automatically. Once you finish creating your report, you can “Save” your report and it will generate a report based on the start date or you can “Save and Run Once”, which will save your report template and run the report you created. Note: If you need information about setting up a FTP Connection, please reach out to your Flashtalking contact. “Auto-Refresh” is a general term for ad technology that initiates a new request for an ad impression to be served without the requirement of a new page load. An Auto-Refresh impression might occur in the context of say a live-updating stock-ticker or sports scoreboard, or it could be triggered by time, some kind of user-interaction/activity, or through other programming. If you use Auto-Refresh ad technology, and the total number of impressions triggered by Auto-Refresh is material (>5%), we can discuss implementing the capability to provide a segregated count of such impressions in our reporting. If this applies to you, and you would be able to provide Flashtalking with such a signal, say as a parameter on the ad call, please contact us to discuss implementation. Thanks! The Flashtalking Team will be in touch shortly. © Copyright Simplicity Marketing 2007-2019. Flashtalking is a trademark of Simplicity Marketing Ltd.